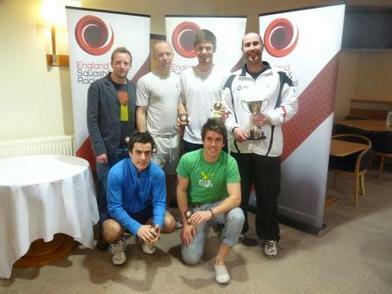 THE INTER COUNTY RACKETBALL FINALS STAGED AT THE WEST HANTS SQUASH & RACKETBALL CLUB IN BOURNEMOUTH SAW A ROUND ROBIN EVENT BETWEEN SUSSEX, DORSET, WARWICKSHIRE AND DEVON. THE 1ST ROUNDS ON SATURDAY SAW SUSSEX PITTED AGAINST HOME COUNTY DORSET AND DEVON TO FACE WARWICKSHIRE. THE IRREPRESSIBLE TIM VAIL OF SUSSEX GAVE DORSET NO 1 CLIVE EWINS A RACKETBALL LESSON, AS MUCH AS CLIVE PICKED UP VAIL WAS CONTIUALLY ASKING THE QUESTIONS WITH CLIVE ALWAYS SLIGHTLY OUT OF HIS COMFORT ZONE 1-2 DORSET. PAUL TAYLORS RACKET SKILLS WERE ALWAYS TOO GOOD FOR A NERVOUS GARY CHISSOL MAKING HIS DEBUT FOR SUSSEX TO GIVE DORSET AN UNASSAILABLE 3-1 LEAD AND FINALLY NEIL CHAMBERS BEAT BRANDON HANLEY IN AN ENTERTAINING 3-1 TO GIVE DORSET A 4-1 VICTORY. A YOUTHFULL LOOKING WARWICKSHIRE SIDE COMPRISING OF JAKE GRAYSON, JACK MCILVENNY, LEE CURTIS, ANDY WARMINGTON, AND ROB ALGER DIDNT GET ANY JOY OUT OF A VERY STRONG DEVON SIDE, GRAYSON DISAPPOINTED AGAINST JAMES SNELL AND ONLY ALGER MANAGED TO TAKE A GAME FROM MATT BAKER A VERY STRONG DEVON NO 5. ON TO THE NEXT ROUND ON SATURDAY AFTERNOON, SUSSEX FACING DEVON, DAVE PALMER AT 3 FOR DEVON WAS RESTED AND A VERY STRONG NO 6 GAVIN PERRETT STEPPED IN AT 5 AND MADE SHORT WORK OF GARY CHISSOL. BAKER UP TO 4 RISISTED A SPIRITED CHALLENGE FROM MILES JENKINS IN THE 1ST GAME BUT THEREAFTER IT WAS DEVON ONE WAY TRAFFIC. CHRISTIAN TURNER AT 3 FOR DEVON WAS SO SOLID AGAINST BEN HUTTON OF SUSSEX AND GROUND OUT A 3-0 VICTORY. THE MATCH OF THE TIE SHOWED JUST WHY TIM VAIL IS NATIONAL CHAMPION, JAMES SNELL A VERY GOOD RACKETBALL PLAYER IN HIS OWN RIGHT AND ONE OF THE BEST IN ENGLAND GAVE A VERY ENTERTAINING PERFORMANCE AND GOT A LOT BACK, HOWEVER VAIL WAS ONCE AGAIN ASKING THE QUESTIONS WITH EVERY SHOT AND ALTHOUGH SNELL THREW THE KITCHEN SINK AT THE 3RD GAME AND NARROWLY TOOK IT A BAGEL LOOKED ON THE CARDS FOR VAIL IN THE 4TH AS HE MOVED A TIRING SNELL AROUND THE COURT TO ESTABLISH A 9-0 LEAD, SNELL THEN MANAGED TO GRAB 3 POINTS BEFORE HIS PAIN WAS OVER. THE DEAD RUBBER SAW MIKE HARRIS BEAT BRANDON HANLEY COMFORTABLY 3-0 TO GIVE DEVON A 4-1 VICTORY AND PUT THEM INTO SUNDAYS FINAL. THE TIE BETWEEN WARWICKSHIRE AND DORSET WAS A ONE SIDED AFFAIR AND DORSET WERE 4-0 UP IN DOUBLE QUICK TIME, ONLY JAKE GRAYSON WHO UPPED HIS GAME FROM THE MORNING DEFEATED CLIVE EWINS AT 1 IN 4 GAMES. AS IT TURNED OUT BOTH WERE CRACKING FIXTURES AND BOTH WENT DOWN TO THE WIRE. SUSSEX AND WARWICKSHIRE GOT OFF TO AN EVEN START ROB ALGER BEAT GARY CHISSOL IN 4 FOR WARWICKS AND BEN HUTTON ALSO IN 4 AGAINST LEE CURTIS TO RESTORE THE BALANCE. ANDY WARMINGTON AT 4 PUT WARWICKS AHEAD WITH A 3-0 VICTORY OVER A FRUSTRATED MILES JENKINS AND THE MAESTRO TIM VAIL TOOK ON JAKE GRAYSON TO TRY TO DRAW THE TIE LEVEL, AFTER TAKING THE 1ST VAIL BADLY TWISTED HIS ANKLE DURING THE 2ND AS THIS HAMPERED HIS MOVEMENT GRAYSON SAW HIS CHANCE AND TOOK THE 2ND, VAIL SENSING HE NEEDED TO SPEND AS LITTLE TIME ON COURT AS POSSIBLE ONCE AGAIN ASKED QUESTIONS WITH EVERY SHOT AND WRAPPED UP THE NEXT 2 GAMES TO MAKE THE TIE 2-2. EVEN A ONE LEGGED VOLE IS A DANGEROUS PROSPECT!! IN THE DECIDER BRANDON HANLEY ROSE TO THE OCCASSION AND BEAT JACK MCILLVENNY 3-0 TO GIVE SUSSEX 3RD PLACE OVER WARWICKSHIRE. NOW TO THE FINAL AND HOW INTERESTING IT LOOKED ON PAPER, IT LOOKED TO BE ANYONES MATCH. AT 5 MATT BAKER WAS RESOLUTE AFTER DROPPING A GAME TO JAMIE BROOMFIELD AND TOOK VICTORY 3-1 TO PUT DEVON 1 UP. ANDY “SO SOLID” CORBEN WAS TOO STRONG FOR THE ERRATIC DAVE PALMER AND DREW LEVEL FOR DORSET IN STRAIGHT GAMES. THEO WOODWARD AND CHRISTIAN TURNER PRODUCED A MIND NUMBING 1 HOUR 34 MINS FOR JUST 3 GAMES, UNFORTUNATLEY FOR DEVON TURNER WAS ON THE RECIEVING END OF ALL OF THEM AND WOODWARD PUT DORSET 2-1 UP, SNELL WAS SUPERB AGAINST EWINS AND A LONG 3-0 SAW THE DEVONIAN SET UP THE DECIDER. ENTHUSIASTIC YOUTH AGAINST AN EXPERIENCED RACKETBALL PLAYER WAS THE LAST COURSE ON THE MENU AND ON THIS OCCASION YOUTH PREVAILED OVER 3 VERY TIGHT GAMES MIKE HARRIS DEFEATED NEIL CHAMBERS TO GIVE DEVON THE INTER COUNTY RACKETBALL TITLE FOR THE 2ND YEAR RUNNING, GREAT ACHIEVEMENT FOR A VERY STRONG IN DEPTH WEST COUNTRY SIDE. A SPECIAL MENTION MUST GO TO MY PLAYER OF THE TOURNAMENT TIM VAIL, CLEARLY THE BEST RACKETBALL PLAYER OF THE WEEKEND WHO PUTS BUMS ON SEATS AND PLAYS THE GAME AS EVERYONE WOULD DEARLY LIKE TO.